Stripe is an online payment processing service that allows you to accept online credit card payments on your Wild Apricot website. Stripe supports recurring payments (aka subscriptions) and does not require you to set up a merchant account. Once you've integrated Stripe with your Wild Apricot site, visitors to your site can pay online for membership fees and event registrations, and make donations. For security reasons, credit card information is not stored in Wild Apricot. Instead, it is securely transmitted to Stripe where it is processed. Stripe then returns the status of the payment transaction, which is recorded in your Wild Apricot transaction details. Before you can set up your Wild Apricot site to accept online payments through Stripe, you must set up a Stripe account. Within your Stripe account, set your account status to Test if you want to test your Stripe setup on Wild Apricot, or set it to Live if you want to begin accepting payments immediately. Wild Apricot does not support the use of webhooks with Stripe accounts. Once you've set up your Stripe account, you can integrate it into your Wild Apricot site. Click Your Account from the upper right corner of your dashboard. Click the Account settings option. Within the options on the left, click API. From the API keys page, copy your secret key and your publishable key to a text file. If you want to test your Stripe setup, copy the test keys. If you want to accept payments right away, copy the live keys. Now, you can integrate your Stripe account into your Wild Apricot site. 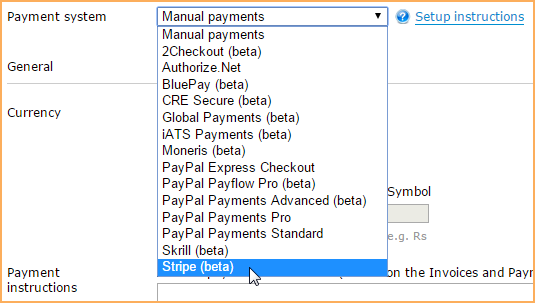 Click the Payment system drop-down list and select Stripe. If you want to begin accepting online payments immediately, click the Live radio button. If you want to test your settings using test credit card numbers provided by Stripe, click the Test/Sandbox radio button. While in test mode, your payment provider will accept or decline your test transactions as it would live transactions, but will not charge any credit cards or update any bank accounts. Wild Apricot will, however, create payment records and update Wild Apricot balances as it would with live transactions. In the Secret key field, paste the secret key you copied from your Stripe account. In the Publishable key field, paste the publishable key you copied from your Stripe account. Select the credit card types you want to accept. Click Validate account to make sure your Stripe account key is valid. Click the Default country drop-down list and select the country where the majority of your visitors reside. Your selection will appear as the default country to your customers. Select the currency you want to use in your transactions. Do not change the currency after your site begins accepting online payments. If you change the currency, existing payment records will not be recalculated and will no longer display correct amounts. 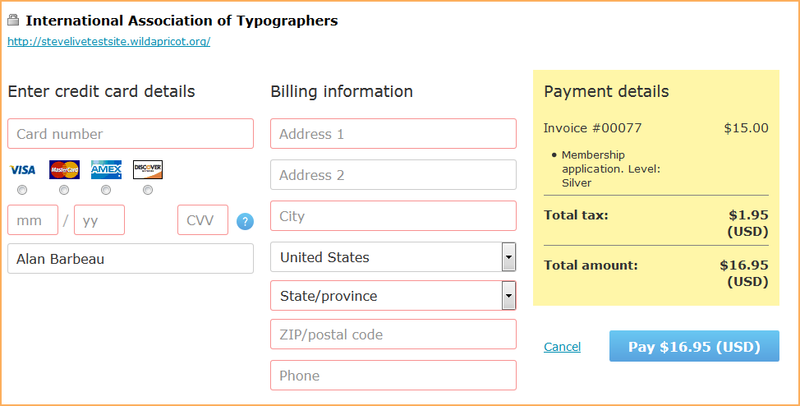 In the Instructions fields, add payment instructions to be displayed to your customers. Now that you have set up your Wild Apricot site to receive online payments through Stripe, a Pay online button will appear after a visitor to your site clicks the Confirm button while applying for membership or registering for an event.